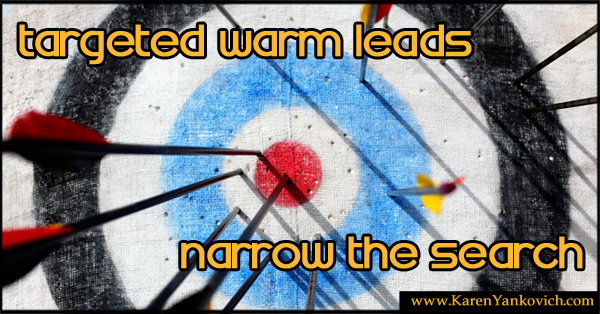 Targeted Warm Leads on LinkedIn. Let’s Narrow the Search. Last week I gave you a challenge and for those who accepted it, you should be right smack in the middle of it now! I trust you are still working hard at committing to 30 minutes a day to reach your pot of gold. How’s it going? Have you found your groups? Have you reached out to your recent connections? Those just joining us click here to find out what we are talking about and join in! Hard-workers, keep doing what you are doing, because today I want to add another layer of LinkedIn Leverage and show you how to find Targeted Leads. Think traditional marketing. Think trade show. Think solid, real connections. Follow me step-by-step as I walk you through how to find targeted leads on LinkedIn to narrow down your prospecting. Ready to find your gold?! Step One: Research keywords and phrases for the prospects you have in mind. Brainstorm: What’s their title? Their job function? The size of their company? What skills do you want them to have? Name the keywords they will list as their expertise or in their job description. Step Two: Click on “advanced” to the right of the search bar. Fill in as much information as you can from your brainstorm above. Take a look at the choice: “current” vs “current or past”. Most likely you want them to be currently working at that title and occupation, but if you are looking to only network or reach out for advice then “current or past” may be the way you want to go. For now choose 1st degree connections only. This will keep the pool narrow to begin with. Take a look on the left side of the screen in the white bar. It will show the numbers of people, based on relationship and location, that turned up in the search results. For example, see the screenshot on the left of a quick search. 11 first connections is a fantastic first start. 3200 2nd connections might be a little much sort through, so add a few more terms. Make them local – possibly you want to be able to meet them for coffee if it’s a potential partnership idea, maybe you want to narrow their title, or add another keyword to the mix to really target your search. When I add another keyword my 1st connections results reduce to 6, and 2nd connections to 1100. Voila! LinkedIn will deliver warm leads directly to your inbox! Step Four: Head back to your LinkedIn 30 minutes a day habit and focus on this lead list, you generated from your searches today. Send them a message about their networking goals, comment on their posts and updates, or find them on Twitter. See… you’re already expanding your horizons! Is your advanced search turning up good leads? Or maybe you need help brainstorming keywords? It’s what I do, and I love to do it. Message me any Q’s and I’d be glad to help. As always please connect with me here and let me know how it’s going. To your success! Join my LinkedIn Group, Profitable Social Media Tips, and let’s talk about more ways you can target your leads! Wow, Karen, once again you’ve come through with simple, yet very concrete ways to play around and get to know LinkedIn. I missed the post about the 30-minute challenge, but really, what a great way to slowly immerse yourself in something new. I’m going to start today! I love that you breakdown the steps to be easily understandable. Setting a 30 minute timer is my next step, TY Karen!! this concept of “warm leads” is interesting. i’ve met most of my potential partners through groups that i have joined. i will check out your step-by-step method, karen. Great tip! Thank you for helping to demystify “LinkedIn” as well as showing the value it can hold for networking and marketing! oh, I had to laugh as I saw Michelle’s comment above because I was just thinking the SAME THING!!!!! LOL..
Karen your tips are fabulous! But I just can not get into it! Mind you I did post 2 things on linked in in the last week and did gain a few new subscribers from linked in! Maybe I will do your 30 minute a day project one day! Karen, once again, I am absolutely amazed at your LinkedIn strategies. I just had no idea you can do so much with LinkedIn, so it was never my choice of Social Media Platform to market from.